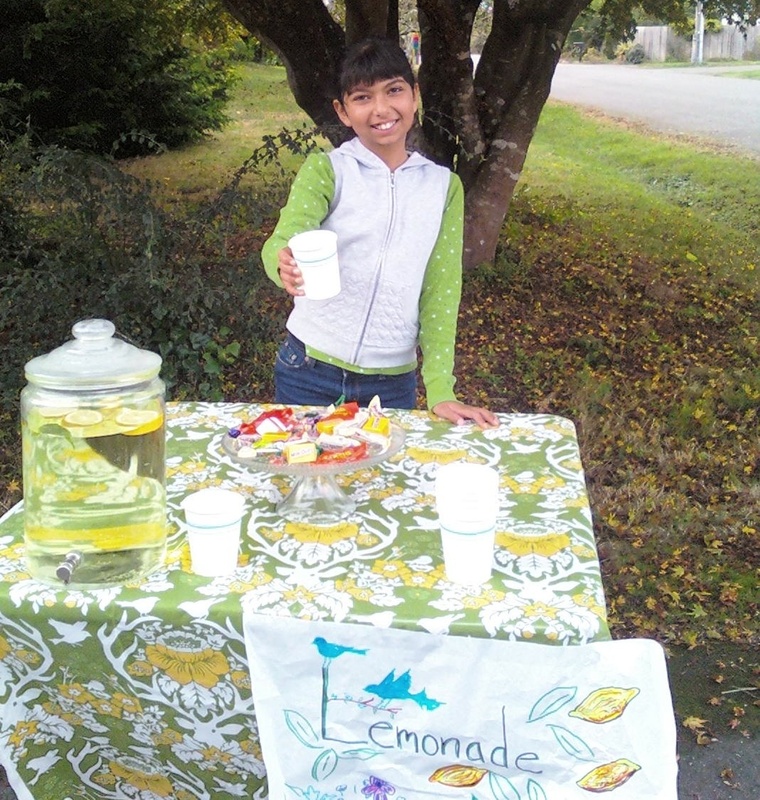 ARCATA – I call my stand LemonAid and my slogan is “Saving Animals’ Lives.” I started selling lemonade for animals when I was seven years old and now I am 11. I saw a coin jar for the Humboldt Wildlife Care Center and wanted to give more than the change my mom gave me to put in a jar. The center takes care of injured and abandoned wildlife in my hometown. I wrote a story for the Arcata Eye (May 23, 2007) about my friends’ and my stands and then I was awarded a Kohl’s “Kids Who Care” award for helping my community two years later. I also volunteered at Sequoia Humane Society to socialize kittens and puppies and I donate to them also. I have learned a lot by having lemonade stands, like working together with friends to make the jobs fun and easy, to ask for help when I need it, to count money, to figure out ways to make people want to buy lemonade (giving free cookies and telling them that their money goes to helping animals) and to meet people in my community. Lots of really nice people have supported me and my stands like Kevin Hoover at the Arcata Eye, Susan Seaman from the Arcata Economic Development Corporation, Cathy Miller, Merry Maloney, the managers at Murphy’s Market, Sandy and Gary from Hank’s Coffee House, Vivienne Tracy who said very nice things about my stands in the Eureka Reporter, the producer of “A Little Good News” for giving me a TV segment and all of my good friends. I also learned that my lemonade needs to be good and fresh and that making colorful signs helps to sell what I make. When my friends and I were little we were shy but I would always force myself to yell out, “Lemonade for sale, only 50 cents, comes with a free cookie, help save animals’ lives!” I would say this over and over. Sometimes I make a little bit of money and sometimes I make a lot but I donate every penny to help animals and this always makes me feel good. I don’t know how many stands I have had but I always meet nice people who want to help animals. I am not sure how much money I have made all together, but Merry, who started the Humboldt Wildlife Care Center told me that even a little bit of money helps to feed animals or give them surgery and nurse them back to health. I tell my customers this. One year I made more than $300. Sometimes I am tempted to spend the money on other things like an X-Box but I don’t, I always donate all of my profits to help creatures who need our care. Lemonade stands have given me the confidence to try to sell other things. I want to make gluten-free cupcakes and sell those someday and start a small business when I am in High School. I also used a big stand to put my signs on. My friend Maddi and I went to Bayside Pet Care and Grooming and put up signs next to Hank’s. We had a lot of customers even though the signs were blown away, our balloons blew away and then when we got new ones they popped, but the customers kept coming. I gave away free recipes for the cookies, free newspapers donated from the Arcata Eye and free cookies. I also got extra help from a surprise friend Mattie. It was extremely hard working in the wind too. I made a new recipe for the LemonAid, with one of my best friends Madii. Here is a tip for your lemonade: use organic ingredients. If you like it tart, don’t use water. If you like it sweet (or not so tart) use more than one-and-a-half cups of sugar and water (per 10 lemons). We were all tired today but we kept on working and even though we haven’t counted the money I am sure it will be a lot. We also tried real hard to educate people about where their money would go and how it will help save animals’ lives. If you are selling cookies, have gluten-free cookies too, because some people like me are gluten intolerant. I used sign spinning across the street and this helped. I spun a sign like a pizza person. So did Madii and Maddy. Lemonade Day was fun to have the chance to unite with other kids to sell lemonade! I made $111 with my friends! Plus I have more to donate from a few stands I had by myself in front of my house. Those jars have $60 in them. All together I can give the Wildlife Care Center and the Humane Society $171 and split the money half and half. I also got to see some animals I am helping like, baby crows, a gold finch, doves, a goose, a gull and an adult crow. I also am helping a fawn, baby skunks and other animals in the future and now. I am proud of my donations and my earnings. I give every penny to helping animals. I have a PICC line IV situation on my arm, so I can’t socialize animals anymore at the humane society so I am happy to help in another way. This entry was posted on Wednesday, June 29th, 2011 at 1:37 pm	and is filed under News, Community. You can follow any responses to this entry through the RSS 2.0 feed.